If you noticed the gathering clouds this afternoon then you’ve seen the first signs that our first major rainfall of the season is on it’s way. Fall doesn’t officially begin until early on the 23rd, but this will definitely feel like a fall event. The first pulse will come on Wednesday afternoon. The second, stronger one from the same system will come on Thursday and Friday. It is noteworthy that this will deliver a major punch to the North and Central coasts of BC that got whacked with major flooding a couple weeks back. For us, EC is predicting 30-40mm on Wednesday. The GFS model is predicting a little less than that. Thursday/Friday will be the same or greater and will last 24hrs rather than the 12 or so for Wednesdays event. We should get a decent break for the weekend. After that though, we should expect to see the remnants of Typhoon Roke which is impacting central Japan today. As you can see from the image below, it will be curling up into the Gulf of Alaska and should send some serious rain our way for Monday and Tuesday… In the 40mm range. The image isn’t great but you can see the white track line of Roke ending up in the Gulf of Alaska much like the storm that is affecting us wed/thurs/fri. It isn’t unusual for west pacific typhoons to end up in our area much like it’s not unusual for atlantic hurricanes to end up in the British Isles they both get carried by the jetstream once they move north of tropical waters. I should end with a mention that over 1 million people are under evacuation orders in Japan today. 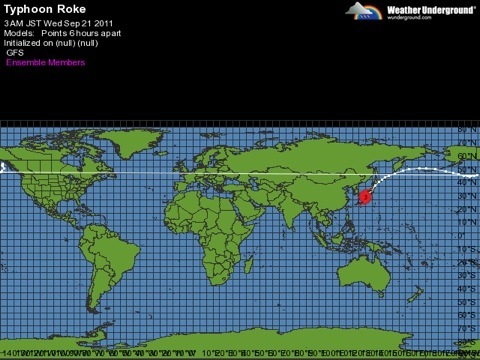 Roke will be packing 150kph winds when it hits. Thankfully it will not be anywhere near that next week when it gets to us. Next Blustery First Day of Autumn! 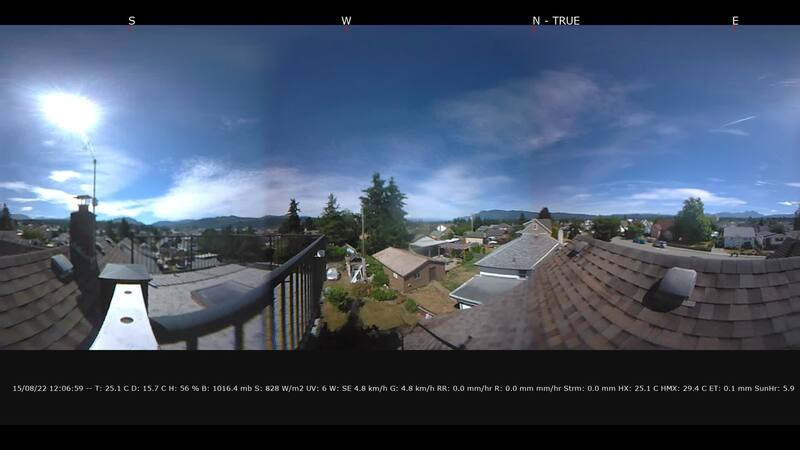 Mike weather station in Ukee http://www.ve7prt.bc.ca/wx/weather.htm is reporting well over an inch of rain so far, the bulk of it since 8am this morning… my guess is its coming this way. Wow, the Islandweather stations in Ucluelet and Tofino have already received 50mm and 60mm (2in) of rain today. Just looking now (as of 1054pm) and Mikes site in Ukee rang up 75.8mm or 2.98 inches of rain, the bulk of that from 8am to 5pm.